John was born in Houston, Texas and grew up in Richmond, Texas. After graduating from high school, John attended Texas Tech where he met and later married Janice in 1979. After graduation from Tech the couple relocated to Dallas where John began his career as an Engineer. 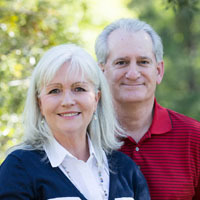 John and Janice attended Webb Chapel Church of Christ in Dallas and in March of 1981, John was baptized. John has worked for several companies during his career and currently works for Siemens. John & Janice have one son Andy who currently lives & works in Houston. The couple enjoys being involved in the Church and have devoted much of their lives to serving in various ways. They often find themselves doing whatever opportunity seems to have the most need. Both John and Janice enjoy teaching and continue to do so often. Janice is truly an accomplished home maker and thoroughly enjoys cooking. John enjoys playing golf and fly fishing when he has time. Without question, their greatest past-time has always been spending time with their son, Andy.